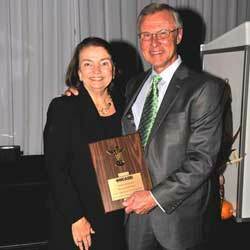 The Alcohol & Addictions Resource Center was honored to present the Bronze Key Award to Mary Jane and Bill Stanley on October 30, 2014 at the Hilton Garden Inn. The Bronze Key is a national recognition award granted by the National Council on Alcoholism and Drug Dependence to an individual or organization that has made an outstanding contribution to an NCADD affiliate. It is the highest local award presented by an NCADD affiliate.